By Geert Lovink, April 6, 2019 at 4:59 pm . 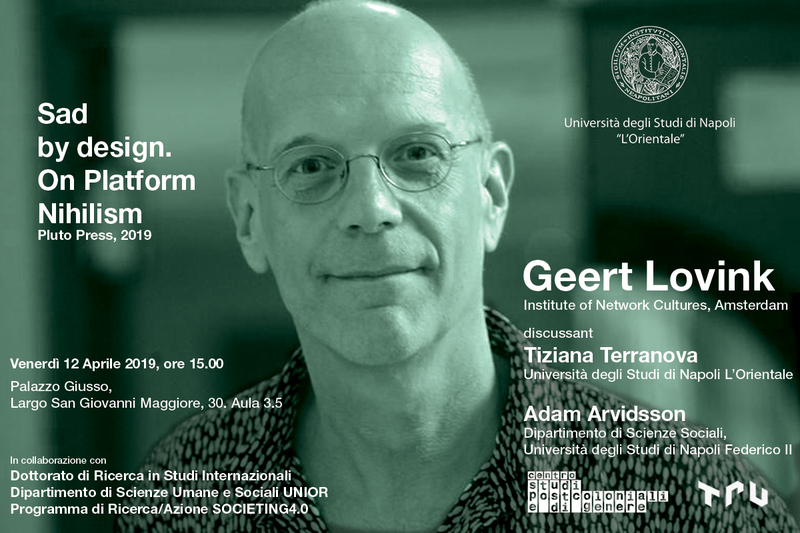 Interview with Geert Lovink by Teresa Numerico about the recently published Italian translation of Sad by Design (EGEA/Bocconi Editore: Nichilismo digitale, L’altra faccia della piattaformea), for the Il Manifesto newspaper, April 6, 2019. Two book launches are coming up: Rome, April 1o (John Cabot University, 6.30 PM) and Napels, April 12 (l’Orientale, 3.00 PM). TN: In Sad by Design you seem rather pessimistic about technology; you cite the “rage against the machine” of the seventies. Have you changed your mind about the effects of digital technologies? I really appreciated the chapter “From Registration to Extermination: On Technological Violence”. It is rather scary what you write here. Are you really suggesting that there is a similarity between the final solution project and the list creation of the Big Data approach to profiling and behavior anticipation? GL: I have not changed my belief in the emancipatory-subversive potential of the internet, but the world itself has changed its course. What happens when rightwing populism and digital technologies both keep growing exponentially? As the integration of digital technologies into our everyday life advances, and society moves in a xenophobic direction, genocide is no longer an unthinkable option. Despite all their algorithms, filters and moderation team Silicon Valley insists to have anything to do with content. They are dying to work with authorities to facilitate organized hatred and are more than willing to design invisible, clean, blockchain enabled, extermination procedures. It is cynicism for the good, in line with the pedagogical motives of social credit system in China. The case I am referring to in the book is Facebook’s role in the ongoing expulsion and genocide on the Rohingyas in Myanmar—a big silence there, similar to Zuckerberg’s inability to respond to the use of Facebook Live in the Christchurch massacre. TN: Do you think that the lack of attention is a crucial problem in the actual fruition of the digital media? Do you believe that we can fight the individual battle against distraction using strategies of mindfulness and disconnection practices? Or are you considering collective action? GL: Collective actions that delete entire platforms as acts of civil disobedience are the way to go. Yet, the daily reality is one of boredom, loneliness and numbness through sheer exhaustion. We stare at the screen, go back to that same conversation, time and again. Why there’s no answer? We need to politicize this type of distraction and not correct it with New Age therapies. We so want that intimate contact with the other, right now, that’s what drives us back to the phone, at all cost. Distraction is the product of our social crisis, the lack of community and the desire for it that disrupts us from our daily duties. We are entitled to have these dreams. The desire for the social is not a distraction but a human right. In Silicon Valley behavior scientists have studied these all too human affairs and turned them into ingenious profit machines. This was a cleaver move that we should overrule with an even more genius one. TN: You cite Bernard Stiegler, especially in relation to the struggle against computational determinism. Do you think that the reorganization of the networks according to Stiegler’s suggestions on local integrity and regional crypto network is feasible? GL: The strength of Stiegler, and related technology philosophers such as Yuk Hui, is their idealism. With this I do not mean their supposedly naïve view on world affairs but the strong believe in the power of ideas. I myself learned that from Isaiah Berlin and conceptual art. Ideas matter, they are dangerous. Software, networks, mathematics are based on notions that are prepared, discussed and even tested in society, long before they materialize in tangible prototypes and products. Our task is to convince the general public of the strategic relevance of this basic work that philosophers and artists do at the conceptual forefront. This where the position of Europe comes in. Stiegler and others build foundations for alternative network architectures. We can complain about American supremacy until we drop dead. Where do geeks, programmers, entrepreneurs, scientists get their ideas from? Let’s not fall into the Steve Jobs trap and believe in some genius inventor figure. These days, technology is completely delegated to engineers that merely execute existing models. Both speculative and critical thinking are being marginalized in this process. We need to change this. And don’t worry, these abstract ideas can easily be translated into codes. We need to first figure what exactly our own values and concepts are, soon after the applications will follow. TN: In the book you discuss the necessity to go beyond the cultural studies and the Frankfurt school, and create new stories as a resistance and a revolutionary tactic. But how can we create such new stories, and the new effective memes of the left wing reorganization, if we are completely involved and pervaded by the flux? Do you still believe that art can act as a cultural avant-garde in the present media landscape? 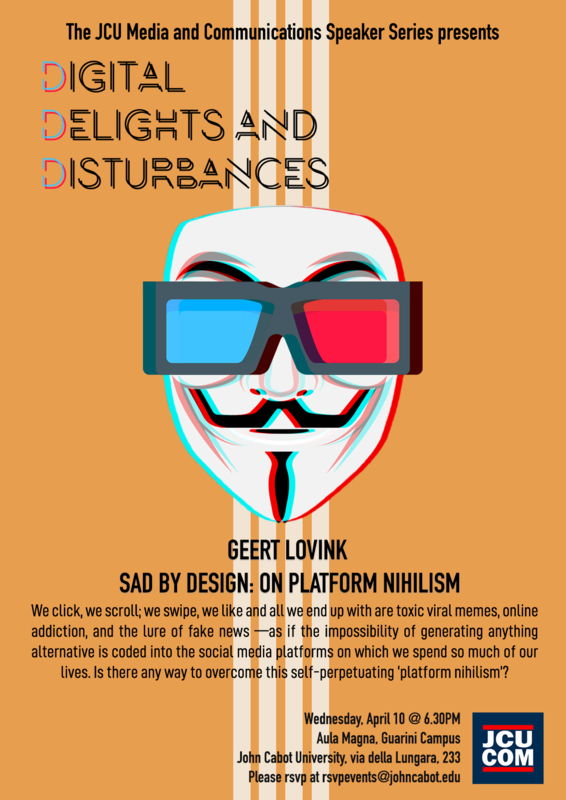 GL: In our internet-related field both art and theory are strong as ever. This should not come as a surprise as there’s so much going on. 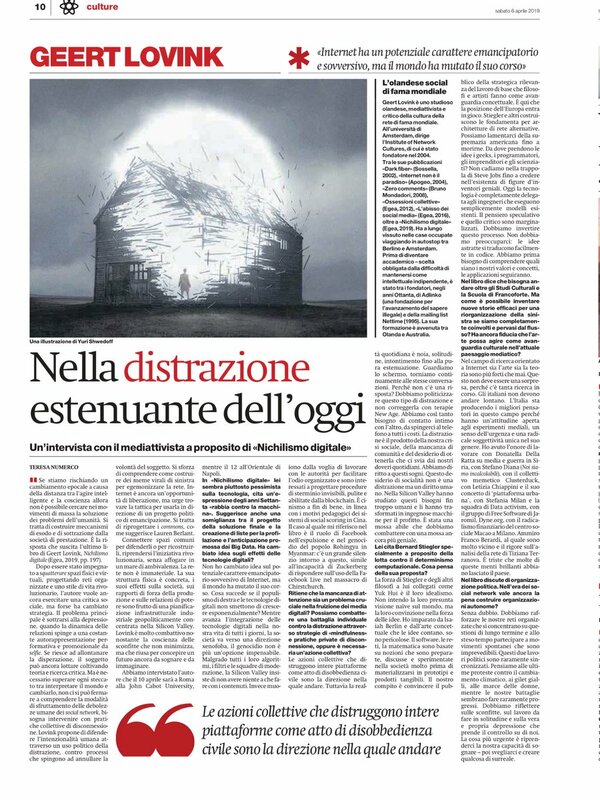 Italians do not need to travel far; the country is producing the best thinkers in that field as they have an open attitude towards media experiments, have a sense of urgency and you combine that with a unique radical subjectivity. I recently had the honor to work with Donatella della Ratta on media and war in Syria, with Stefano Diana (Noi siamo incalcoabili), the meme collective Clusterduck, Letizia Chiappini and her ‘urban platform’ concept, Stefania Milan’s data activism team, the free software Dyne.org crew around Jaromil, the financial radicalism of the Macau social centre in Milan, and not to forget the theorized despair of Franco Berardi that I very close with and the rigor of Tiziana Terranova’s network analysis that I can only dream of. And last but not least you. Many of these brilliant minds have left the country, which makes us sad. The Italian brain drain needs to stop but I do not see any sign of a turn-around. TN: As usual in your books, in the last chapter you discuss about a political perspective on organization. In the social network era, do you believe that we can work on autonomous organizations? GL: No doubt. We strengthen our organized networks that work on long-term issues while also participating in highly unpredictable spontaneous movements. These two types of political work that are rarely in sync. Think of the latest protests against climate change, yellow vests, women’s marches, while our own struggles rarely seem to make progress. Think of all the setbacks, the work that is done in isolation and the very real depression that takes command of us. What’s most urgent is to take back our capacity to dream–then wake up and create something surreal.